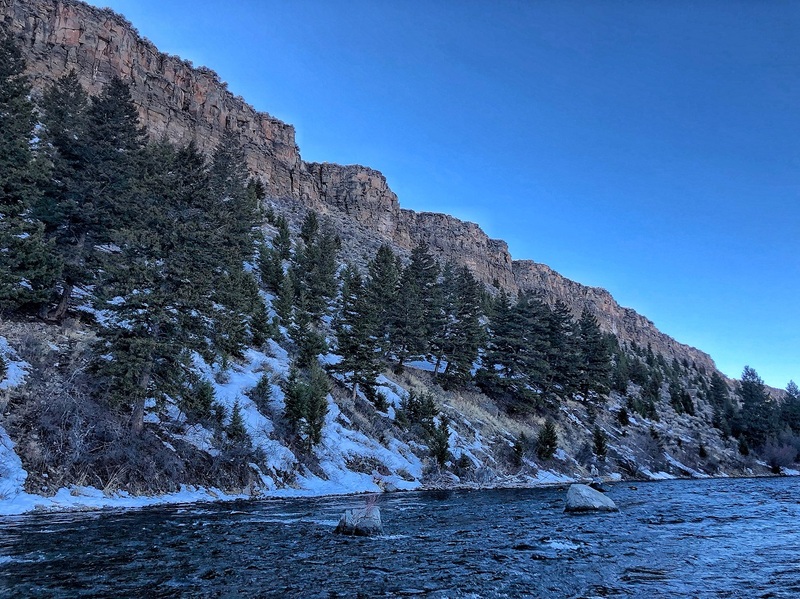 It’s been absolutely beautiful on the Upper Madison over the last week or so, and highs in the low to mid 40’s have been a welcome relief from the sub-zero temperatures we experienced for much of late January through February. The current snow water equivalent in the Madison Range is still sitting at 119%, so we are still in great shape for what should be another great season in 2019 and you can bet that we haven’t seen the last of Spring snow up the mountains. Fishing has been excellent in the upper wade stretches with nymphs and we are still getting some good dry fly fishing in the late morning to early afternoon hours. It’s still all about the midge game above Pine Butte, so a good selection of zebra midges, jujubees, and black three dollar dips have all been good choices lately. Larger patterns such as Pat’s Rubber Legs and San Juan Worms have been more productive downstream from the West Fork area and into the float section. Pods of fish rising to midges have been tougher to find down low, so I would stick between Raynolds and Three Dollar Bridge if you are looking to get in on some more consistent dry action. We are still getting fish to eat a #20 Goober Midge well, but there are still days where they are looking for smaller adults and emergers. If you are getting refusals on the #20, a #22 Hanging Midge or CDC Midge Adult in gray has been the code cracker. We should start to see the rubber leg bite pick up in the upper wade stretches once the water temps start to increase a little more. Raynold’s: Still a lot of snow and no access to the parking lot. Pine Butte: No access and you will definitely get stuck. One to two weeks out. Lyon’s: Again, tons of snow and it is going to be at least another 2-3 weeks before you can get a trailer in. Some people have been sliding rafts down the high bank. Palisades: There’s a 100 foot drift blocking the road leading up to the first outhouse on the left. Still a no go. Ruby: The road in there is a little rough but the boat ramp area is all clear. Varney: It’s still a little slushy so bring a tow strap just in case, but people have been definitely been taking out there. We do not recommend floating below here yet, but float at your own risk down to 8 Mile and be prepared for a lot of hard work taking out with a hard boat of a raft. 8 Mile: We definitely wouldn’t recommend taking out here. Some people have been getting out using pontoons and rafts but there is still 4 feet of shelf ice that you have to get your boat up and over. Take out at your own risk and definitely check it out before you commit. Ennis: Road and Boat Ramp Closed.